For its 160th anniversary, Ernest Borel unveils a collection of ten watches that pay tribute to its founder, Jules Borel, and his watchmaking legacy. 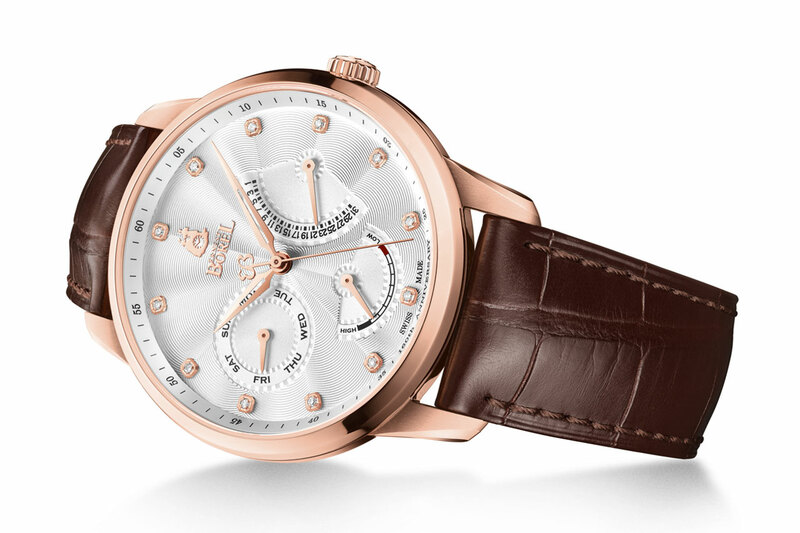 Among the models in this anniversary line, Ernest Borel presents an exclusive timepiece that lends an air of classic elegance to the much-appreciated indications of day, date and power reserve. A highly legible silvered dial, the perfect proportions of the pink gold PVD steel case, and the superlative reliability of the mechanical automatic movement together express the quintessential expertise which the brand has deployed since 1856. A contemporary expression of Ernest Borel's rich history, this refined timepiece is distinguished by its enduring appeal. This is a lesson in style, proposed as a limited edition of 888 pieces for men who appreciate classic watchmaking and mechanical precision. Mechanical automatic, 21 jewels, 28,800 vib/h. Rhodium-plated and circular-grained Côtes de Genève. 42-hour power reserve. Hours, minutes, seconds, day, date and power-reserve indicator. Steel with pink gold PVD treatment, 40 mm. Anti-reflective sapphire crystal and transparent back. Water-resistant to 50 metres (5 bar/165 ft). Silvered, set with 12 diamonds. Retrograde date at 3 o'clock, power reserve at 6 o'clock, date at 9 o'clock. Brown alligator leather with folding buckle.